Frascati (LNF) in 1987. He was appointed as INFN First Researcher (Senior Research Staff) in 2005. He received by Italy Ministry of University in 2013 the habilitation as Full Professor in Theoretical Physics of Fundamental Interactions and the habilitation as Full Professor in Theoretical Condensed Matter Physics. He coordinated (1999-2002, 2011-2015) all LNF theoretical physics activities. His research interests include theoretical physics, condensed matter, biophysics, physical chemistry, nanoscience and nanotechnology, nanocarbon based composites, biomedical applications. His lab cultivated over 30 between PhD and master students in theoretical physics, condensed matter, nanoscience and nanotechnology. He published over 500 papers in peer-reviewed journals with h = 45, http://scholar.google.com/citations?hl=en&user=mOq8urEAAAAJ, and more than 10 invited book chapters. He is the Editor and/or co-author of more than 10 books with Springer. He appears in the list of Top Italian Scientists published by the VIA Academy. He received the B.W. Lee Prize at Erice School of Subnuclear Physics (Erice, Italy) 1982. In 1980 he was selected as Summer student at CERN (Geneva). He is Series Editor of Springer Lecture Notes in Nanoscale Science and Technology, and biannual (2012-2014) Associate Editor of Nanoscience and Nanotechnology Letters. He is Editorial Board Member of the Journal of Nanomaterials and many other scientific journals. He is Director of the NATO Emerging Security Challenges Division, SPS Programme project “Development of Biosensors using Carbon Nanotubes”. 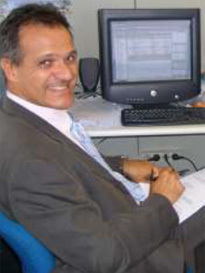 He is INFN scientist in charge of EU projects “NAmiceMC—Nano-thin and micro-sized carbons: Toward electromagnetic compatibility application”, and “FAEMCAR—Fundamental and Applied Electromagnetics of Nano-Carbons”, Partner of “Graphene-Based Revolutions in ICT And Beyond, GRAPHENE Flagship”, and INFN scientist in charge of Italy Ministry of Health project “Delivery and imaging of miRNAs by multifunctional carbon nanotubes and circulating miRNAs as innovative therapeutic and diagnostic tools for pediatric pulmonary hypertension” and of Italy Space Agency project “SHAPE- A New Theoretical Framework of the Microgravity-Cell Interaction”. He is LNF Spokesperson of GSS Supersymmetry project and INFN National Spokesperson of SEMS Condensed Matter Theory project.